Traditionally, eLearning industry has followed the linear development process forever. ADDIE is probably the most well-known method of this linear process. With clear Analysis, Design, Development, Implementation, and Evaluation stages, this time proven method has been successful and has played a key role in defining our industry. Whether we are working on big projects or small, full-fledged web-based training development or short mini-bursts in the form of videos, the first thing that we do is create a project plan and then try and follow it. Sometimes we succeed, sometimes we fail. However, the one thing that stays true for all projects is that we work with defined efforts and timelines. But can creativity be limited by these numbers? What if the customer’s needs change? What if the Instructional Designer has a brainwave at the eleventh hour? What if the media designers want to change the visual approach to create a better product? The traditional linear way of working does not allow for such changes at later stages of the project. In comes the leaner way of working. Agile, with cross-skilled teams and an iterative development methodology, allows for changes and creative ideas at all stages of the project. Widely used in product development and IT, in agile development teams produce smaller pieces of content and review and enhance their work in multiple iterations or sprints. There is no leader, no manager, no reviewer, and no sign-offs. There are only the product owner, the development team, and the scrum master. The development team converts the vision of the product owner into a tangible product and the scrum master facilitates the process. The agile teams are self-organizing and hold full accountability for the product. Agile development brings all stakeholders together periodically. The group collectively selects one short piece of the product and then develop it in the next iteration or sprint. All challenges are quickly resolved in periodic meetings. The product created can then be tested and refined in subsequent sprints. Working closely with the product owners, or the customer and subject-matter expert, agile teams reduce the development time to create a viable product much faster than the traditional ways of working. This allows the customers to get a taste of the end product sooner to test its effectiveness and accuracy. In line with the ‘fail fast and recover faster’ approach, being agile gives the opportunity to the teams to produce innovative solutions that solve business problems, with a lot of checks and balances along the way. Flexibility is the mantra behind the agile approach. With multiple iterations, the customer gets ample opportunity to provide feedback while the product is being developed. This polishes the customer’s needs early in the project lifecycle and saves on wasted effort in developing something that is not hitting the mark. Periodic testing once a smaller piece is ready also reveals any technical bugs early in the process, giving the teams an opportunity to work out the cranks sooner. Learn more about agile project management for eLearning in our free guide. All of these are direct contrasts to the traditional ways of working where the content and technical review happens when the entire module has been developed, leaving little time to fix any bugs and improve the product. Agile is not just a shift in the project management method. Agile is a shift in the mindset of every team member and customer. Being agile means that team members are always open to change, are ready to collaborate and solve problems together, and are geared up for a challenge. It is like driving a car – ready to adapt to changing traffic conditions while keeping the focus on the road and the destination at all times. 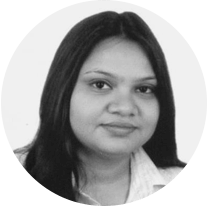 Vandana Kumar is learning specialist with over 15 years of experience in instructional design, project and people management. She specializes in needs and audience analysis and designing innovative solutions. She has worked extensively in both K12 and corporate segments of learning design with customers from all parts of the world. Vandana tries to give back to the society by working with underprivileged children, running weekend education and life skills workshops. She is a reader, painter, and interior designer. In her spare time, she can be found creating new things with her seven-year old daughter.